Radiology is the area of medicine that utilizes X-rays, radioactive tracers and ultrasonic waves to detect, diagnose and guide treatment of numerous diseases and injuries. Developments in technology, computers and science are further advancing the capability to image inner body structures, tissues and organs. The dynamic images that radiology provides are essential to both physicians and patients, thanks to their realistic depiction of the anatomy, functions and abnormalities within the body. Radiologists can interpret imaging studies, act as consultants to other specialists and perform interventional procedures. Rancho Springs Medical Center offers several types of radiological procedures. Magnetic resonance imaging (MRI) uses radio waves and a strong magnetic field to create clear, detailed images of internal organs and tissues. Since X-rays are not used, no radiation exposure is involved. Instead, radio waves are directed at the body. This exam takes 30-50 minutes on average and consists of several imaging series. Many studies will require a small intravenous injection of a contrast agent. However, this agent does not contain iodine, an element used in other contrast agents for X-rays or computed tomography scans. MRI is often used to evaluate or diagnose orthopedic (spine, extremity) or neurologic (brain, spinal cord) abnormalities. Angiography is an imaging procedure that takes images of blood vessels in various parts of the body, including the brain, heart and kidneys. This imaging helps doctors to determine whether the vessels are diseased, narrowed, enlarged or fully blocked. Magnetic Resonance Angiography (MRA) is a noninvasive procedure that uses MRI to study a patient's arteries in the brain, heart, kidneys, gastrointestinal tract, aorta, neck, chest, limbs and pulmonary system. MRA is a painless, shorter exam than a catheter angiography, which uses x-ray imaging guidance and an injection of contrast material, to look for abnormalities. MRA does require an intravenous injection of Gadolinium. The results of MRA may be used to determine whether surgery or treatment such as angioplasty is needed, and to plan that treatment. Computed Tomography Angiography (CTA) uses a computed tomography scanner to noninvasively produce images of vessels and screen for arterial diseases such as aortic dissection, carotid stenosis, aneurysms and vascular disease of the kidney. Iodine is used as a contrast material during the procedure. Compared to MRI, CTA is faster and can be performed on patients with pacemakers and other metal implants. Computed tomography (CT) scans use special X-ray systems that image the body from different angles and use computer processing to show a cross-section of the various tissues and organs pictured. 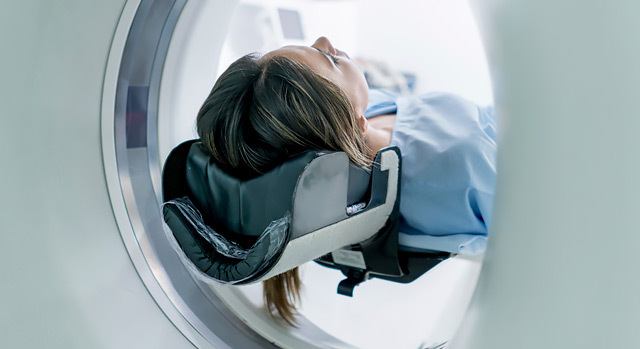 CT scans, which expose patients to little radiation, are helpful in diagnosing cancer, cardiovascular disease, infectious disease, trauma and musculoskeletal disorders. A spiral or helical CT scan captures multiple images of a patient’s anatomy using an x-ray machine that scans the body in a spiral path. With helical CT scan, there is less likelihood to miss small tumors or abnormalities. And because a helical CT scan takes less time than traditional CT, the procedure is beneficial for the elderly, children and acutely injured patients who are sensitive to longer exam times.